To see “Why I Love Middle School posts #1-6” please click here. The next day when I came in kids were questioning whether or not it was real, how could they have missed me passing out the slips! Most understood it was a joke…until…one student rose up and brought forth a permission slip (wish I could give that kid an “A” for the year). This being 8th grade, if it says so on a permission slip then it must be true. 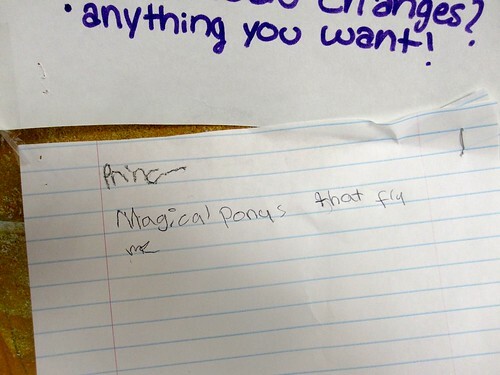 There were many doubts about the reality of the mystical unicorns, but maybe, just maybe there was now some truth to it since it was after all….on a permission slip. I thanked the student and assured him a spot on the bus. The next class walked in and several more students turned in slips. Many in the class were now worried that they were not going to have a spot on the trip, especially since I did not have any more forms. In the last class of the day, a student turned one in and I took one look at the form, one look at him and said that I cannot accept it because the parent signature had been clearly forged. He immediately felt bad about it and said that he thought it was ok to do that because he thought it was a joke, and he could get the real signature after school. Unfortunately for him it was too late. It was first come, first served, and the bus had been filled. I am setting up a PayPal account if you would like to send me money to bet, I am putting it all on Steve. 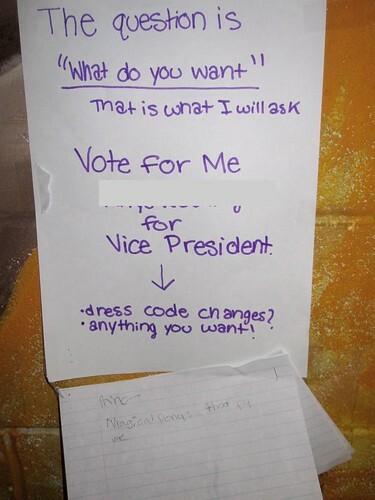 As I have stated before, I love the quirky things middle schoolers do. They are a source of endless smiles if you let them roam a bit. Our last project was a bit scary. 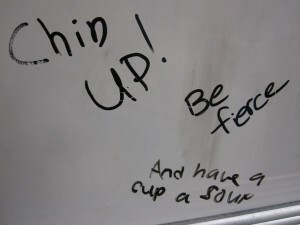 During the course of it signs with the words “Chin Up” and “Be Fierce” kept showing up on the walls as the due date came near. The project came and went, and the signs came down, but apparently the words got stuck in the kids’ heads. There are always doodles that mysteriously appear on the back board that give me an endless supply of smiles in the morning. The doodle below gave me the first smile of today. It is from three separate authors that put together create some kind of deep symbolic 14 year old message. New to reading or never commented on a blog? Click here first! 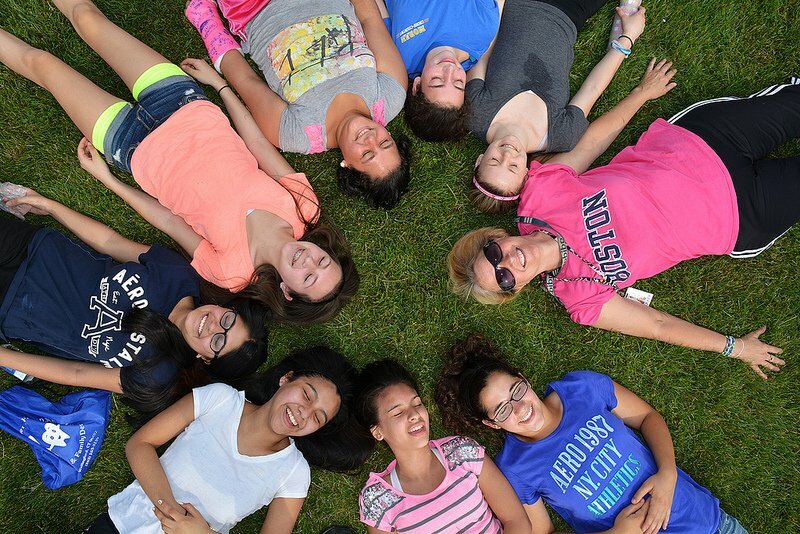 Middle School kids are great, and most people tell me either you love middle school or hate it. I love the spontaneous quirkiness of 8th graders. They can take any topic, or activity and turn it into something fun if you let them. A while back I posted Why I love Middle School #1, and I think I will try to get a new one up each month.